Decorative mid-century table sculpture of 1970s pennies flower stand. 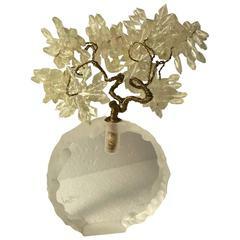 Small Mid-Century Modern Lucite sculpture by Van Teal, signed (see detailed image). Marble fragment sculpture of bosoms. 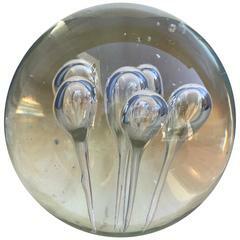 Large handcrafted Italian crystal sphere with hand blown air pockets. Vintage coral-toned marble faceted cube sculpture, Italy, 1970s. Pair available, priced individually. A beautiful and substantial green malachite decorative object sculpture piece in an egg shape form. Piece measures: 2" diameter x 2.75" height.